Trapper Badovinac has explored and fished the Rocky Mountain west since his childhood days in southern Colorado. Often trading snowshoes for hiking boots or a horse, he’s bushwhacked over little known passes with camera and note pad to find gems sparkling in the form of trout streams or bugling elk. With the keen inner compass of an explorer and the eye of an artist, he’s captured the nuances that nature only reveals to those silly enough to awaken before dawn to stumble along in the dark on an uneven trail. Trapper Badovinac guided professionally on the Missouri River for nine years and authored a book titled ‘Fly Fishing Montana’s Missouri River’. Listen in to learn all you need to know about fly fishing one of America’s great rivers. Trapper worked as a professional fly fishing guide for eleven years, nine of them on the Missouri, Smith, and Blackfoot rivers in Montana. He's tied flies commercially for shops in Colorado and Montana and still ties all his own flies. 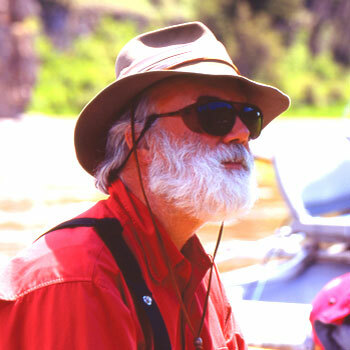 His articles on fly fishing have appeared in several magazines including Fly Rod & Reel, Northwest Fly Fishing, Montana Sporting Journal and Northwest Travel and he has penned two books Fly Fishing Montana's Missouri River and Fly Fishng the Solitude - Montana with many more to come. Trapper is also a professional photogrpaher and graphic artist and has won numerous photography awards including some from the Professional Photographers of America. He continues to write, photograph and lectures on fly fishing and entomology. To learn more about Trapper Badovinac visit his website www.ShootingStarPublications.com.